1862-1864 Fr George F Dillon, curate 1864-1869 ? Towards the end of September in the year 1853 a young Irish priest stepped from the coach that drew up outside the little post office of the village of Armidale. The long journey over the rough and dusty road that threaded its way up the valleys and mountain ranges from Sydney was ended: and a longer journey from the far away shores of his native Ireland had finished for the young priest who had volunteered for the Mission fields of Australia. His first feelings were of relief that the tedious days of jolting over the broken track were in some fashion ended and that the long miles of bush-covered country had led him to a town that was to be his home. He was at “home” because this was his parish and the “Cead mille failte” of the half-dozen Catholic men who came forward to welcome him drew from him the warm-hearted response and kindly smile that were to make him beloved by all men in the years to come. So came to New England its first resident priest, the Rev Fr Timothy McCarthy, who was soon known to all and sundry as “Fr Tim”. He was not the first priest to minister in this district. Oxley had crossed the Moonbi Ranges in 1818 after reaching the Peel River, and Allan Cunningham had passed up the western side of the New England Tableland in 1828 on his way to the discovery of the Darling Downs, and by 1832 the first settlers were “squatting” on the Highlands. Armidale became the quarters of Commissioner of Crown Lands, George James Macdonald in 1839 and there was by then a considerable number of settlers between Ranger’s Valley and Walcha. The first Catholic priest to visit New England was Dean James Hanly. He had gone by boat to Brisbane in December 1843 and was summoned to attend a Synod in Sydney in the following June. Finding no other means of transport available, he set off to cover the 700 odd miles on horseback. “Guessing the track” most of the way, he passed by Ben Lomond, where he baptized and married John Trim, and thence onto Armidale, where he baptized Margaret Kennedy, “the first white person born in Armidale – in 1842”. At Salisbury, he stayed at Marsh’s Station, it is recorded, and during his trip wherever it was necessary, he administered what sacraments he could, but, having no vestments with him, did not say Mass. During the following eight or nine years, the Catholics of the southern part of the Tableland were visited by Dean John Rigney of Singleton and Dean John T. Lynch of Maitland, and those of the northern parts were attended by Fr McGinty from Ipswich, and Fr Downing. 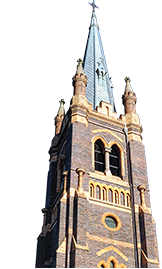 But the Parish of Armidale dates its history from lst October 1853, when Fr McCarthy began his pastoral mission in a “parish” that was considerably larger than his native land. Fr “Tim” was born in Ireland at Ballinhassig in 1829. His studies for the priesthood were made at Carlow College, where he was ordained in 1852. In October of that year he sailed for Australia and reached Port Jackson in March 1853. In August of the same year he was appointed to Armidale and arrived at his destination towards the end of the following month. He was but twenty-four years of age and was ordained little more than one year. His parish or district extended from: Singleton to Ipswich and from the Pacific Ocean westwards as far as he cared to go. With no bush experience or knowledge and the nearest priest more than two hundred miles away, he was nonetheless unabashed by the magnitude of the task that confronted him. It was a missionary undertaking that would have delighted the heart of St Paul, the great Missionary, who, had he been about, would surely have written another Epistle with joy to this modern “beloved son, Timothy”. With his presbytery complete and the Chapel enlarged, he soon had the local congregation visited and organized. The next step was to visit the outlying districts. Transport problems were solved by borrowing horses from one Station to another, and, as he was an excellent horseman, the best horses were always at his disposal, and he would turn them loose on arrival at his destination and allow them to return to their masters. He also had horses of his won, and a chance memorandum gives us the information that one was “a chestnut, a fair sized saddle-horse, with a bald face, branded T.E. on the near shoulder, with a switch tail, and another “a bay mare, H.O.I. on the near shoulder and EX. on the offside of the neck – 13 hands high and a ‘nugget form’. – T McC”. Once in the saddle, it was not unlikely that “Florence Court” was uninhabited frequently and for considerable periods. Before Christmas he had visited Glen Innes, Myall Creek, Hanging Rock and Walcha at least, and shortly afterwards was at Tamworth, Cloud’s Creek in the Clarence, District, Bergen Op Zoom, Salisbury, Peels River and Wee Waa. In January 1855 he had Fr Edmond Walsh with him, perhaps a visiting Priest who remained for some months, and in December he received a curate. Fr John Thomas Dunne, who remained until October 1860. Between them they covered immense tracts of country, on horseback and over incredible tracks across and down the ranges. During the year 1855, the Baptism records show they were at places as far apart as Armidale and South Grafton, Walcha and the Namoi River, Gunnedah and Rocky River; while other place names recorded at this time are Kentucky, New England, Glefernagh, Bendemeer, Glen Innes, King’s Plains, Wellingrove, “The Bundarra” (River), Aberbaldie, Strathbogie, Breeza‑Duval’s, Armidale, Swamp Oak, Oban and Boorolong. In 1856 the names Bolivia, Carlisle Gully, Fairfield, Tenterfield, Carroll on the Namoi, Aberfoil, Clack Creek (Black? ), Boornanga “new the Walloon” (? ), Big River Bundarra? ), Castle Doyle, Glen Quin-Namoi (now the Narrabri district), Kangaroo Hills, Melville Plains‑Namoi River and Liverpool Plains. In 1856, Yarrowford, Tabulam, Clifton, Warwick, Dundee, Saumarez and Woolomon were added to the list and in 1857 we find Uralla, Tilbuster, Cobbadah, Castlereagh (? ), Back River, Inverell, Casino, Kelly’s Plains, Lismore, North Grafton and Warialda. Fr Dunne spent much time in the Grafton district during 1857, while Fr McCarthy seems to have been very busy at Rocky river, where gold had been discovered just before Fr “Tim’s” coming to Armidale and where the population had grown from about 150 in 1852 to over 5,000 in 1856. In 1857 the population of Rocky River fell sharply to about 1,400 and the decline continued: after 1864 there was little left. Armidale’s population in 1851 was 556 and in 1854 Amore than 70T. Fr Dunne was transferred in October 1860 and for the next two years Fr McCarthy was again alone, except for a short stay of Fr John Francis O’Neil who came late in 1860 and remained only a few months. In November 1862 Fr George F Dillon came as Curate and remained until August 1864. But by that time Fr McCarthy had left Armidale for Carcoar and Dean J T Lynch had taken his place: he remained until August 1869, alone apparently after the departure of Fr Dillon five years earlier. Meanwhile, Tamworth was clamouring for a resident Priest of its own, but its was not until 1864 that the wish was fulfilled. Fr McCarthy was doing all he could and Dean Lynch was giving assistance, but the extent of the district made it impossible to meet all demands. In 1859 Fr McCarthy built the first small St Nicholas’ Church and from there visited other centres. Dean Lynch was at Walcha on 14th September that year and was expected afterwards at Tamworth. Fr McCarthy was announced for Mass at Gunnedah (at 12 o’clock) on 30th September. Glen Quin-Namoi River on Sunday, 2nd October, at Wee Was on the 4th and at Urrawilki, Bligh District on 7th October. Dean Lynch was the preacher at Gunnedah and Glen Quin on this occasion. Evidently they were giving a special Mission. On 19th October, Fr McCarthy was at Warialda, at Bingara on the 21st, Cobbada on the 23rd and Bundarra on the 25th. Dean Lynch who had arrived in Australia in 1838 and was stationed at Maitland in the same year, was closely associated with New England. Of him Monsignor P Hartigan wrote “He was a first-class horseman and as hard as the horse that bore him. He pioneered the Liverpool Plains, went further north than Armidale and combed the whole of the intervening country.” He was to prove in later years the sincerity of the friendship with Fr Tim, established during their years in this district.